Year in Review: How does one assess Jason Heyward in 2017? It’s nearly an impossible task at this point, since one is going to come to only two conclusions: Heyward is bad at hitting now, or Heyward is bad at hitting now and should get better. Well, I’m in the latter camp, tepidly. 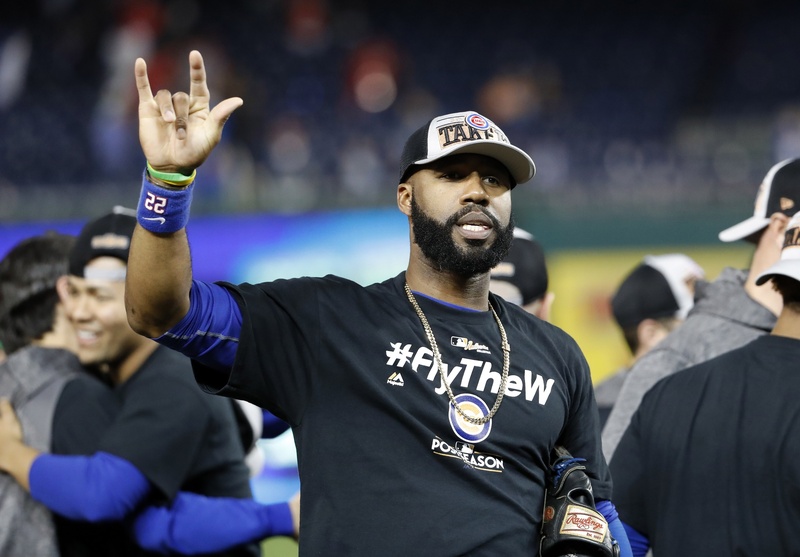 Heyward did make marked improvements in 2017 after a disastrous 2016 campaign, for which we will all forgive him due to his role in the Rain Delay Theater that spurred the Cubs to a World Series championship. I’m going to make liberal use of tables in this profile because I think a visual representation of Heyward’s stats is helpful in making sense of his improvement. So, here’s those same 2017 stats compared to his 2015 and 2016 seasons. Those are, basically, three different players. In 2015, a world-beater who supplements his league-best defense with modest power and great on-base skills. In 2016, a player with negative offensive value, no power whatsoever, and curiously low defensive ratings (which I, of course, reject). And in 2017, a slightly below-average hitter with little power, deriving most value from defense. All of them Jason Heyward, all of them contributing to Heyward’s opacity to a baseball writer like me. The encouraging signs: Heyward got on base more and hit for a little more power this past season, redeeming a bit of his offensive value. His batting average and OBP marks were right around league average, but his power deficit still looms large. Weirder, though, are Heyward’s batted ball trends. He struck out and walked less in 2017, posting career-low marks of 13.9 percent and 8.5 percent, respectively. This is counter to the league-wide trend of fewer balls in play and more of the three true outcomes, and his 84.7 contact percentage this year was seven points better than league average. Heyward is still an impeccable contact hitter—something the Cubs sorely need behind their many low-contact guys—but that might be to the detriment of his overall performance. The 27-year-old veteran balanced an 80-plus percent contact rate with above-average offensive production for several years before he came to the Cubs, and we can only hope he would return to that. Looking Ahead: …What will Jason Heyward contribute to the 2018 Cubs? His world-class defense will remain, as evinced by his four consecutive Gold Gloves. That alone is worth starting him in right most days, as I’ve argued recently, especially if the Cubs keep rolling out one of Kyle Schwarber, Ben Zobrist, or Ian Happ in the outfield on most days. Offensively, we should keep our expectations as low as possible. I don’t expect Heyward to crater and repeat the smoldering hole of his 2016 performance, but there’s a good chance that 2017 Heyward is just who he is now. I’ve been guilty of Heyward offensive apologia in the past, and have attempted to parse his complex batting stance and approach to figure out what the hell is wrong with him, but at this point that’s futile. One would be wise to accept Heyward’s significant offensive warts and hope he can make minor improvements in his on-base and power numbers. One reason to disregard everything I have said, though, is new hitting coach Chili Davis. Davis had success in Boston with their slate of good, young hitters (Mookie Betts, Xander Bogarts, Andrew Benintendi, Jackie Bradley, Jr.), but three of those players took steps back in 2017. Would Davis be able to guide Heyward toward some changes that result in success? I’m skeptical—but less skeptical than I would have been had the Cubs retained John Mallee. In the end, being the best defensive right fielder in the majors with a .260/.330/.400 slash would be an ideal future for Heyward and the Cubs. Anything more is gravy. And, chances are, Heyward will not be opting out after either of the next two seasons, so that’s the guy they’re going to keep.